While purchasing some more anime on Amazon, I ran across a little gem that I had never heard of before. Sky Crawlers comes to us directed by Mamoru Oshii of Ghost in the Shell, Jin-Roh, and Avalon fame, and the two hour long feature includes some stunning animation. The aerial combat scenes are beautifully and very realistically rendered. The story focuses on a group of young fighter pilots in an alternate historical setting. The meat of this film truly lies in the story of its characters however. In light of this, I think some may find themselves wanting more action scenes and not getting their fill. Again, as with so many war related anime, I find that Sky Crawlers really questions the purpose of war. This becomes evident when the secrets of the story are revealed. Throughout the film I felt a sense of familiarity with the aesthetics. I couldn't quite put my finger on it until the latter portion of the film where the characters visit another town. The buildings immediately jumped out at me as being remarkably like those in Poland. Sure enough, signs in Polish and even characters speaking in Polish appeared shortly thereafter. I had no idea that this was the case when I order the film, and I was very pleasantly surprised! 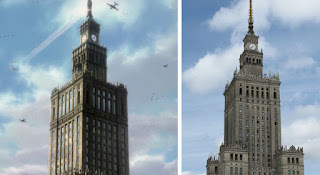 One of the most recognizable Polish buildings is the tower like structure in the film. It is actually the Palace of Culture and Science in Warsaw. Shown above is a comparison between the building in the anime, and a photo I took of the actual building last year. As it turns out upon viewing the "Animation Research" featurette, Mamoru Oshii took his staff to Poland in order to experience the culture and take a slew of photos and video in order to base the film's designs on them. I am thrilled that an anime director of his caliber has taken such great interest in my home country. I am rather excited to have found this film, by chance really. I highly recommend it as a more serious film to watch, but also for it's incredible visual quality. Of course if you are an Oshii fan, then you probably already know about it. Either way, don't pass this one up!